Summer comes, ice cream, popsicle, smoothies and juice are spining in my head. Which one can i make immedietly, but i must to make some think for my kids first. Yeah, Popcicle is their favorite, popsicle must be on refregerator all day. 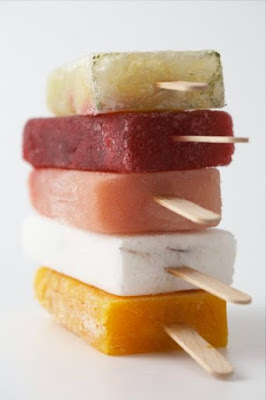 This is popsicle recipes which always i make for kids for summer. Combine 2 1/2 cups seedless watermelon, 1/2 lemonade, 1/4 cup simple syrum (or sweetner of choice) in blender, then stir in 2 tbsp. finely chopped mint leaves (home grown perhaps?!). Pour mixture into ice pop molds and freeze for 4 hours. 1 cup greek yogurt, 1/2 honey (or sweetner of choice), 1/2 chopped and pitted cherries. Freeze for four hours.